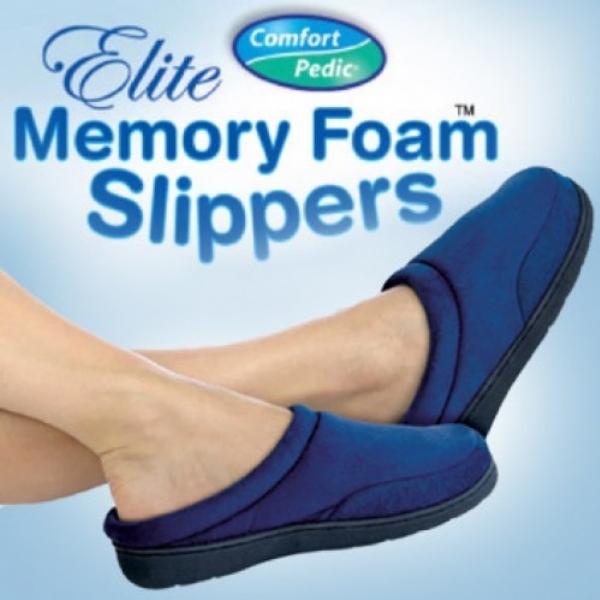 Comfort Pedic Memory Foam Slippers pamper and soothe tired, aching feet. Comfort Pedic Memory Foam Slippers pamper and soothe tired, aching feet. Slip your feet into these plush Memory Foam Slippers, as seen on TV, that cradle your feet with every step. Memory foam is a breathable, temperature-sensitive material that reacts to your body heat to actually conform to the shape of your foot for a customized fit. Soft, luxurious micro-fiber suede uppers and rugged bottom soles. Fits both men and women. Navy . Slip your feet into Comfort Pedic Slippers and experience the most comfortable slipper in the world. These slippers are very comfortable. I just need to know if I can throw them in the washer and dryer when they&apos;re dirty? Very comfortable and look great. Surprised at how well they fit and very easy to get used to having the low heel cup. Highly recommend. These slippers are like walking on a cloud. There are hardly words to explain the comfortable touch on the feet. I am in love! My friend does not have this gift yet. However, I have used these types of slippers, and feel she will love them as much as I did. These types of slippers never seem to dissapoint. Such a delightful feel for those tired little feet. After being disappointed with how quickly my L.L. Bean slippers came apart (the insole seperated from the slipper after only 1-2 months), I decided to try a different route. I based my purchase on Mavis&apos;s review above and have to say that I am extremely satisfied with this purchase. While these slippers are comfortable and conform to your feet, I disagree with one point in Mavis&apos;s review. I never had the sensation of falling when wearing these slippers. They felt like home from the first time I wore them. These slippers get five stars. Great fit and comfort to me as a diabetic. My mother in law is a diabetic and these are the only shoes she can wear! Quality slipper. The size is a bit too large but still fits. In a perfect world there would be a size between small medium and x-tea large, but it does fit and is comfortable. This fit my size 12 foot very well. I was surprised at ho well it fit and it didn&apos;t slip when I walked in them. Its comfortable but I needed to get a medium and they only had large and small. So I got large and it&apos;s too big. So my feet are hurting with this slippers. I just love these slippers. They are the most comfortable slippers ever. They are so soft and conform to my feet. My feet are so relaxed when I wear them. I would reccomend them to everyone. My mom was truly happy! She is a diabetic and they can only wear memory foam slippers. So, her doctor said she needed them and I was happy to get them for her!